I love Italy. The art, the architecture, the landscape, the food, the sun, the sea, and if you have young children, it’s a wonderful place to go on holiday. It is not just the pasta and the ice cream – though those help – it’s that Italians love children and they are never seen as a nuisance. ‘Bella . . .’ an old lady once crooned, as she passed our small daughter in the street. 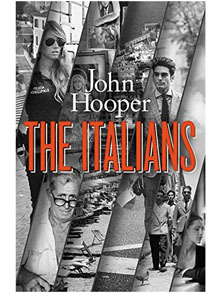 And yet, John Hooper’s marvellous book, The Italians, confirmed me in my suspicions that though I love visiting Italy, I wouldn’t like to live and work there. The Italians is affectionate – but doesn’t pull any punches. As far as career advancement goes in Italy, it really is very often who you know, not what you know. One survey revealed that 39 percent of those interviewed had got their job through contacts of some kind. Graft and corruption of various kinds are rife, never more so than under the governments of Silvio Berlusconi, whose strangehold on the media has been pernicious. Hooper is a journalist, was a correspondent for The Economist and knows what he is talking about. He is enlightening so many things, including the importance that Italians place on appearances (bella figura), on the Catholic Church and the family, on the idealisation of motherhood and the attachment of Italian men to their mothers. (There is not only a word meaning ‘mother’s boy’, but Italian may be unique in having a word for the phenomenon: mammismo). The book is all solidly underpinned by research and enlivened by anecdotes from Hooper’s own extensive experience. I very much enjoyed it and finished it feeling that I understood much more about Italy and the Italians. I, too, loved this book, and it taught me a lot I didn’t know about the Italians. He had a really nice writing style and a lot to say, I thought. I should have mentioned that it was reading about it on your blog that made me want to read it! I agree: nothing superficial about it.